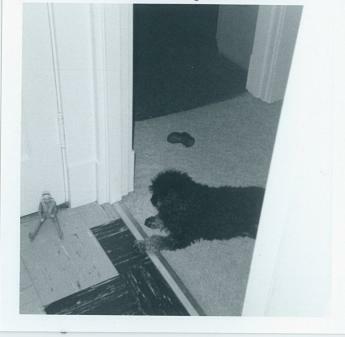 As far as black toy poodles go, Holiday Sunshine was much loved. She was so smart and loved to have fun. We didn't train Holly, Holly trained us!! I did teach her tricks - sit down, shake, roll over, stay, and the hide and go seek game - and she picked these up extremely quickly. Holly liked an old glove of my dad's and liked to take it in her mouth and shake it ferociously around. I'd take the glove, throw it and then run and hide for hide and seek. Holly would run after the glove, get it, shake it a few times, then come after me to find me. When she would find me, she'd run back to the glove, shake it, and the game would start all over again. She found me a lot of times, but a few times I found a new place to hide and she couldn't find me. It was fun to come out of hiding and surprise her!! But then she knew to look there next time we played!! Holly loved a mini afghan I had crocheted, very crookedly! That was in a corner in our kitchen where she liked to go to nap and chill out. She had a stuffed bear that was all hers, too. Here she is after stealing yarn from me while I was crocheting. She grabbed it, ran off and waited for me to run after her. It was so cute we had to get a picture of it! She loved to have fun like that! She had the best sense of humor of any dog! She was such a joy and such a jokester! 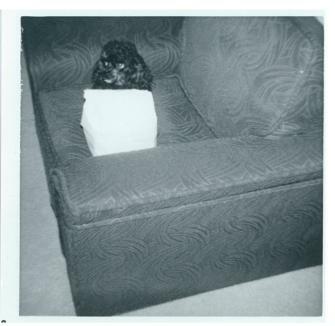 Poodles have an almost human intelligence! Here she is guarding a lunch bag of mine! I was going on a bus trip and mom had packed a nice lunch. So good that Holly could smell it and wanted it for herself! I did get to take it with me though, but Holly would've rather kept it for herself! She had her toys, notice the boot off to the right of Holly; that was her squeaky toy, but she would much rather have my toys. Here she is guarding one of my dolls, or should I say "her" doll! She loved to play with balloons. I'd hit it with my hand and she'd hit it with her nose so we could play and keep the balloon in the air. 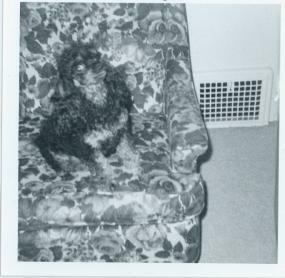 She was so smart, she knew when she was going to the vet or to the groomer's. She'd whimper in the car because she knew where she was going! She'd hear my mom and I when we went back to get her from the groomer's and would be very happy to see us so she could get out of that cage!! We'd have to make over her and tell her how pretty she looked after grooming when she had a ribbon in her hair. When my dad got home from work and would sit down, she'd jump on his lap, put her paws on his chest and look at him until he'd make over her and tell her how pretty she was. Look at her striking one of her poses sitting in the chair. She loved to have her picture taken and would pose and sit still until the picture was taken! Holly had a great sense of humor and loved to play and have fun. She liked to make her own games up. If I would get up in the middle of the night, she'd sneak out of bed and crouch down the hall and wait for me. Then she'd bark at me, I'd scream, and the whole house would wake up. Then she'd go back to bed! She really thought that was fun! Holly was much loved and had a great life. When you see tiny toy poodles for sale - especially black toy poodles! - remember the inspiration for this website. 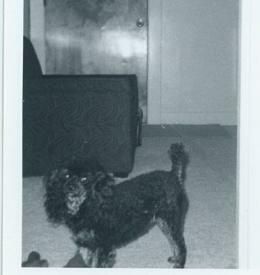 If you'd like to buy toy puppies, and get one of the adorable black toy poodles like Holly, read Poodle Pictures.com. 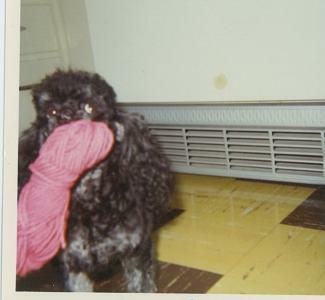 Our site has lots of toy information and information on taking care of a dog - a lovable dog who will be the love and joy of your life, especially one of the black toy poodles! 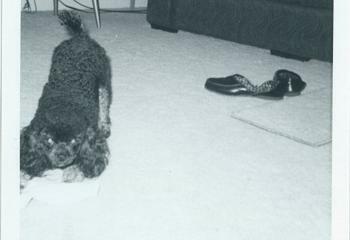 We were blessed to have one of the best black toy poodles, Holly, for 16 years.